Here are the major signs of cancer which you should bring to a physician’s attention if any are present. Symptoms of cancer which may signal some presence of a type of cancer are also discussed. A sign is something that can be seen or heard by another person, for example, a doctor, spouse, nurse, and so on. Symptoms are usually signals that are noticed or felt by an individual having them, but not quickly seen or felt by others. For example aching, weakness, etc. Cancer is a type of disease which can cause many signs and symptoms. These depend on how big the disease is, where it has affected and how much the organ or tissue is affected. If cancer begins and spreads, signs and symptoms may appear in various parts of the body. As cancer develops, it starts to push blood vessels, organs and nerves that are nearby. This pressure results to signs and symptoms of cancer. 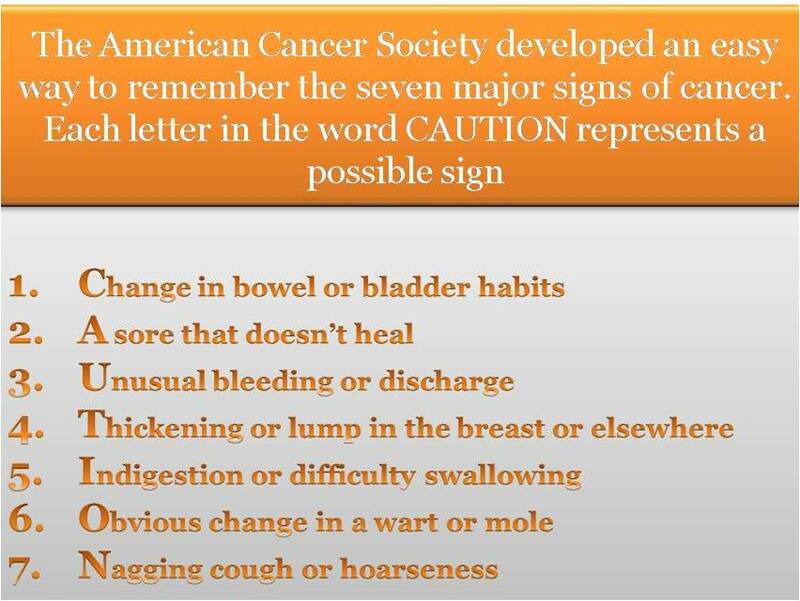 You should familiarize yourself with these seven warning signals for cancer and bring them to a doctor’s attention when found. The recommendations for early detection of cancer in asymptomatic people by the American cancer society should be heeded in regular physical examinations as part of a cancer-prevention program. You will be able to determine how well you are doing in terms of a cancer-prevention program. Although in most cases nothing serious will be found, any of the symptoms calls for a physician’s attention as soon as possible. Scientific evidence and testing procedures for prevention and early detection of cancer do change. Studies continue to provide new information. The intent of cancer-prevention programs is to guide individuals towards a lifestyle that will help prevent cancer and enable early detection of malignancy. Treatment of cancer should always be left to specialized physicians and cancer clinics. Current treatment modalities include surgery, radiation, radioactive substances, chemotherapy, hormones and immunotherapy. If you perpetually experience the following symptoms, then be careful to seek medical attention because cancer could be roaming around. Sometimes we ignore symptoms, not knowing that they indicate that something is wrong. Other people have the fear of what a symptom or sign could mean. But I wish to state that no symptom or sign should be ignored, especially those that maybe are getting worse or have lasted for long. The signs of cancer can be disastrous when ignored. Be smart! Never ignore any abnormality!